NASA's Mars rover Curiosity took this photo of a likely meteorite, known as "Ames Knob," on Jan. 12, 2017. NASA's Mars rover Curiosity has stumbled onto another rock that likely fell from space. The object is a small, dark-gray spot among the reddish rock and dirt that make up the Martian surface, so it caught mission scientists' eyes. They named the mysterious rock Ames Knob and zapped it with Curiosity's laser-firing spectrometer, known as ChemCam, to determine its composition. ChemCam's results suggest that Ames Knob is an iron-nickel meteorite, Webster said. The object's moniker comes from a list of places around Bar Harbor, Maine — the naming convention for the region where Curiosity is currently working, he added. Ames Knob is about 4 inches wide by 5.5 inches long (10 by 14 centimeters). It's the fourth space rock Curiosity has found on Mars, mission team members said. In May 2014, the rover rolled up on two large iron meteorites known as Littleton and Lebanon; the latter is about 7 feet (2 meters) wide. 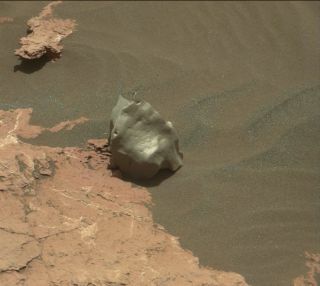 And late last year, Curiosity studied a golf-ball-size space rock called Egg Rock. The SUV-size Curiosity landed inside Mars' 96-mile-wide (154 kilometers) Gale Crater in August 2012. The rover's observations soon showed that Gale hosted a long-lasting, potentially habitable lake-and-stream system in the ancient past. Curiosity reached the base of the 3.4-mile-high (5.5 km) Mount Sharp, which rises from Gale Crater's center, in September 2014 after a 14-month trek. Ever since, the six-wheeled robot has been working its way up the mountain's foothills, reading the rock layers for clues about the ancient Martian environment. Mission scientists hope this slow ascent will help them understand how the Red Planet changed so dramatically over the eons, from a relatively warm and wet world long ago to the cold and dry place it is today. The meteorites found by Curiosity — and by the rover's smaller, older cousins, Spirit and Opportunity — could aid in this quest, said ChemCam principal investigator Roger Wiens, of Los Alamos National Laboratory in New Mexico. "We hope that the meteorites will be able to tell us some information about the Mars environment, such as whether they fell on land or in water, or how dense the atmosphere was when they fell," Wiens told Space.com via email. Editor's note: This story was updated at 3 p.m. EST to include more details on the size of the Ames Knob meteorite on Mars from NASA.